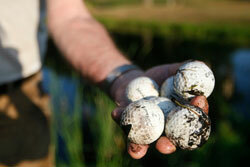 Despite the sport’s clean and sophisticated demeanor, golf balls and clubs are prone to collecting some dirt and grime. Balls can collect dirt and stains on their journey through the course while clubs are often exposed to dirt during a swing, especially if it’s near a hazard. While it’s easy to ignore a bit of filth, it’s best to keep golfing gear clean and pristine. Golf gear is a big investment. Regular cleaning and maintenance can help ensure that the equipment lasts for years to come. Furthermore, clean equipment generally performs better. Even a small amount of dirt on a golf ball can affect its performance. It throws off the weight and balance of the ball, causing it to veer off the intended flight path. Luckily, there are a number of ways to clean clubs and golf balls. Portable cleaners can keep your gear in prime condition while you navigate the course. Products are also available to clean your gear once you get home. Regardless of how complex or simple these cleaners are, they can do wonders for your gear and game. This combo cleaner easily attaches to your golf cart. It has a plunger that pushes golf balls through a container of bristles. To clean your clubs, the unit also has a square container with built-in brushes that are designed to get rid of dirt from the grooves. The unit can hold water and solution without splashing. There’s also a handy t-drain for cleaning. 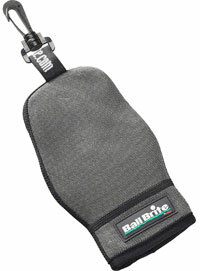 The BallBrite cleaner is a durable pouch that contains a soft lining for cleaning. 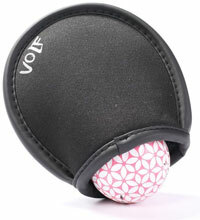 It clips onto your golf bag for easy access and can be used with only water. Simply add two teaspoons of clean water and rub the ball so that the interior lining makes full contact. The cleaner can then be wrung out and air dried. This cleaner is comprised of two different layers. One layer is made from polyester terry while the other is made from cotton. A waterproof membrane separates the two. All it needs is some water to clean the ball. The cotton layer can then be used to dry the ball. The small unit can then be reversed and clipped onto your golf bag for drying. With its tiny size, this cleaner can easily fit into your pocket. The outer layer is made of a waterproof material, so your pocket will stay dry as you make your way through the course. The inner lining holds onto water to stay wet regardless of how hot it is. All it needs is some water before you start playing to provide you with cleaning power throughout the round. This set from Ace Golf has everything you’d need to clean all of your clubs. The brush features soft bristles, wire bristles, and a metal groove sharpener. It has an ergonomic design to fit in your hand comfortably. 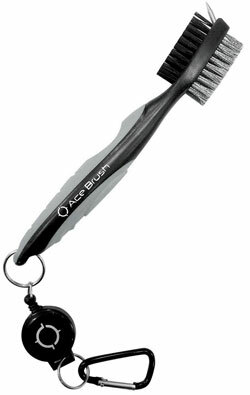 The end is attached to a retractable 2-foot cord and a metal clip to attach the brush to your golf bag. The set also comes with a ball marker. This 3-in-1 brush is designed for convenience and portability. It’s attached to a zip-line carabiner to ensure that it’s always nearby. This brush has one side with soft bristles for cleaning woods, a wire brush for irons, and a spike for getting the stubborn gunk out of grooves. Rubber grips on either side conform to your hand for maximum efficiency. From ProActive is this unique golf club brush. Rather than utilizing two different bristles on either side, the manufacturers opted for a dual-layer design. The middle of the brush has phosphorous bristles while the outer layer bristles are made from nylon. 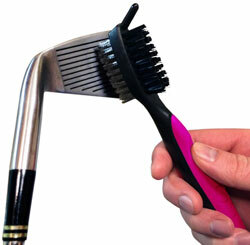 The entire brush head is removable for easy replacements. There’s also a retractable groove spike. The entire brush is attached to a zip-line clip. Cleaning your equipment on the course couldn’t be easier with the right equipment. 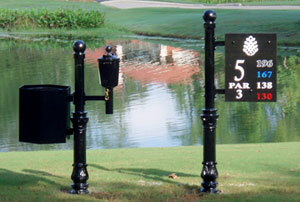 Many golf courses are equipped with multiple permanent cleaners to get the job done quickly and efficiently. Usually placed near the tee box, these cleaners can be used prior to tee off to ensure that your shot isn’t affected by dirt. Ball cleaners typically feature water and soap. The ball is placed in a container and driven down into the cleaner with a plunger. On its way down, the ball makes contact with a number of soft bristles. Alternatively, you can carry around a golf cleaner. These simple devices are compact and designed to safely clean grime without damaging the surface of the ball. They can be used with a unique solution designed for golf balls or simple dishwashing liquid. 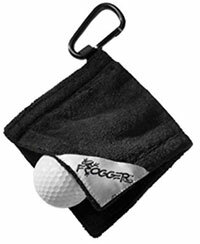 Simply add the cleaning solution to the pouch-like cleaner and rub the ball clean. It’s important to fully dry the ball prior to playing to ensure that water droplets don’t affect your swing. Cleaning clubs is very similar. Portable club brushed are available to remove dirt. They too require a cleaning solution or water. For the best results, you can use a large bucket. However, many club brushes feature two different types of bristles to get rid of any type of dirt. 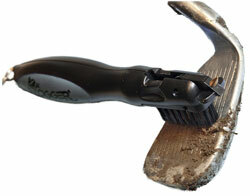 A softer bristle will remove grass and dirt while the metal bristles can tackle mud and dried grime. This solution from Stixx is designed to clean your clubs and the grips. It comes in a spray bottle with an attached carabiner clip for easy access. The spray nozzle evenly applies the cleaner to the club head, where it can then be used with a brush to remove grime. When used on the grips, the spray returns shine and traction. As a multipurpose cleanser, this solution is suitable for your clubs, grips, shoes, and more. The product is kept in a large aerosol can that can evenly coat a piece of gear. All it takes is a simple spray and wipe with a clean cloth. It can lift stubborn stains while restoring the overall quality of golfing gear. The Classic Ball Cleaner from Standard Golf holds 1.8 liters of solution and can hold 4 balls at once. 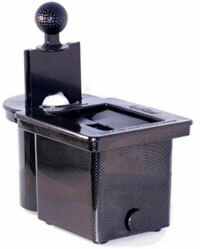 It’s designed to prevent leaks and the buildup of soap with the inclusion of an overflow tube. 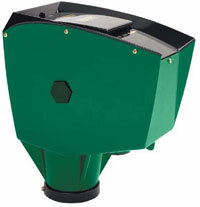 The unit can be emptied and filled quickly with the simple drain. It’s designed to be attached to a post and features a green exterior so that it’s not an eyesore. 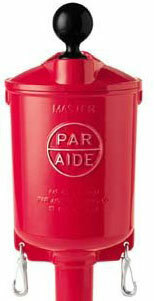 Made from aluminum, the Par Aide ball washer is meant to last. It’s clad in bright red for visibility and is virtually tamper-proof. It can hold 2.4 liters of water or solution and is very easy to use. When it’s time for maintenance, simply remove two screws. There’s also a drain plug for quick water replacement. If you return from the course with a lot of dirty golf balls, you can easily clean them with a bit of dishwashing liquid and a large bucket. Start by removing any loose dirt with a dry cloth. For more stubborn stains, fill a large bucket with warm water. Then, add some dishwashing liquid. The amount will vary based on the number of golf balls you’re cleaning, but it will be around half a cup. You should then let the balls soak for a couple of hours. After that, just rinse them off and let them air dry. If there’s still dirt, you can use a soft toothbrush to agitate it. You should never use metal bristles on a golf ball, as it will damage the surface. Sharpie stains from player marks won’t budge with just water and soap. They require a special cleaner to remove safely. While commercial cleaners are available, rubbing alcohol can do the trick. 91% rubbing alcohol will dissolve the permanent marker. Not only that but it will make the ball shine as if it were new. Just pour some alcohol onto a paper towel and rub the ball clean. All in all, there are many ways to keep your equipment clean. These cleaners and solutions ensure that your golf clubs and balls are always in prime condition for playing. With the help of cleaners, something as simple as a bit of dirt won’t get in the way of you achieving your best score.